. 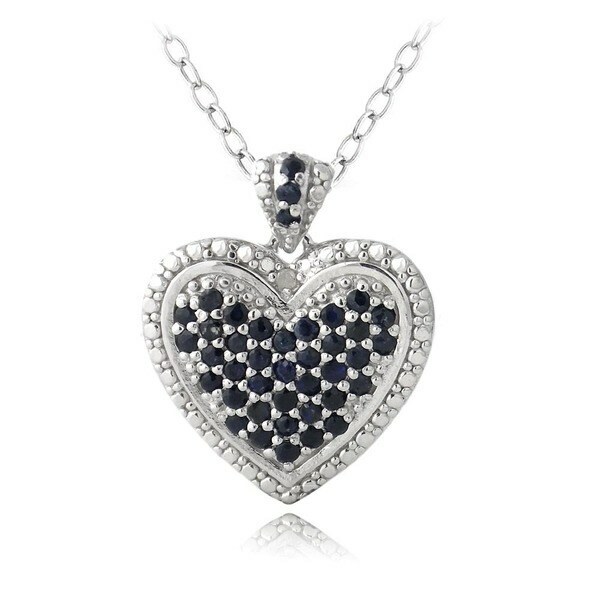 - 2 7/8 CT TGW Created Blue and White Sapphire and D Fall in love with this intricately designed gemstone and diamond heart pendant. Exquisite 2 7/8 carat created blue sapphire stones beautifully compliment the sparkling 0.01 carat diamond accent stones. 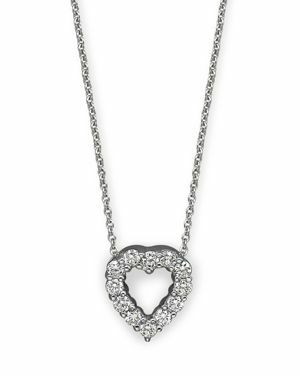 Set in silver.
. - 0.06 CT Diamond TW and 2 4/5 CT TGW Created Ruby S This lovable heart pendant is made with a heart-cut created Ruby stone with white diamonds set in sterling silver. 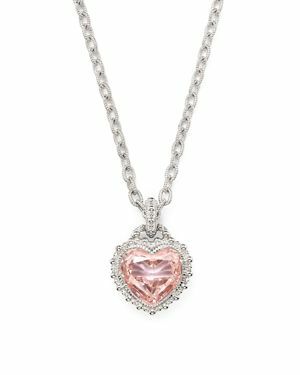 Pendant is hung on a cable chain and is secured with a spring ring clasp.
. - 6 CT TGW Rose de France and Diamond Silver Heart P Fall in love with this intricately designed gemstone and diamond pendant. 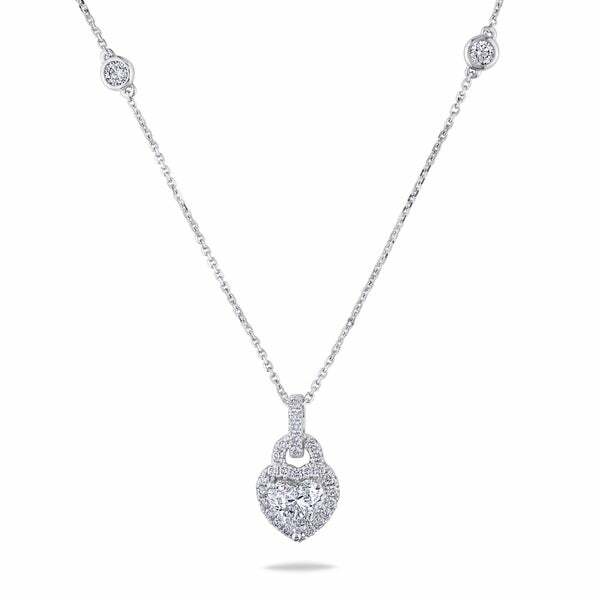 Exquisite 6 ct Rose de France stones beautifully compliment the sparkling 0.06 carat TDW diamond accent stones. 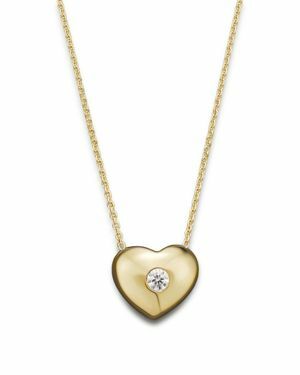 Set in silver.
. - Small Diamond Solitaire Heart Pendant Necklace in From Kc Designs a solitaire heart pendant necklace with diamond details in yellow gold. 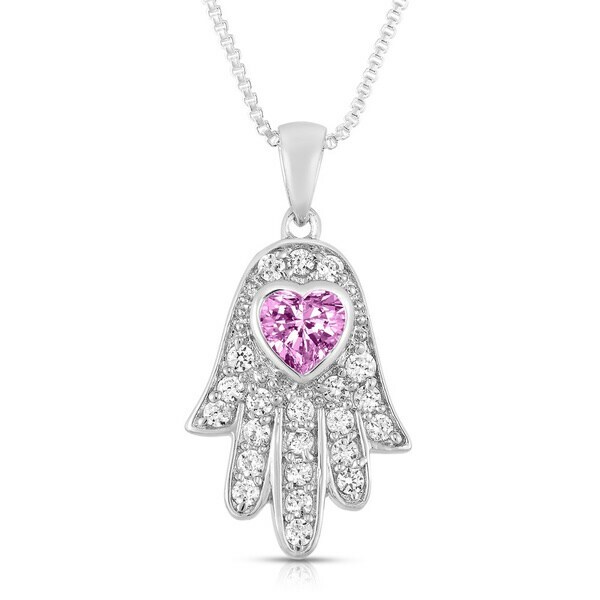 Judith Ripka - Rapture Heart Pendant Necklace with Pink Crystal, Ribbed sterling silver links suspend a faceted pink crystal heart pendant for a darling design by Judith Ripka.
. - 18K White Gold Infinity Heart Pendant Necklace wit A unique take on the classic infinity heart! 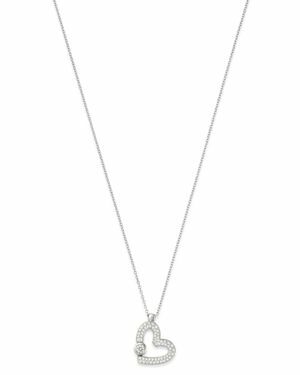 This tasteful pendant is crafted in 18K white gold and features .08 ct tdw in diamond accent stones. 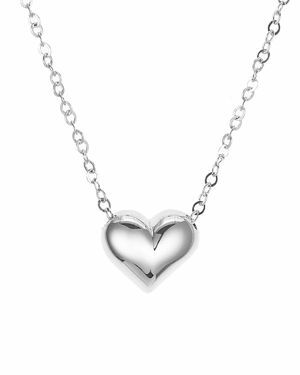 The included necklace is an 18 inch box style chain with a spring ring clasp.
. - 18K White Gold Double Hollow Heart Pendant with Si A unique three heart pendant necklace. 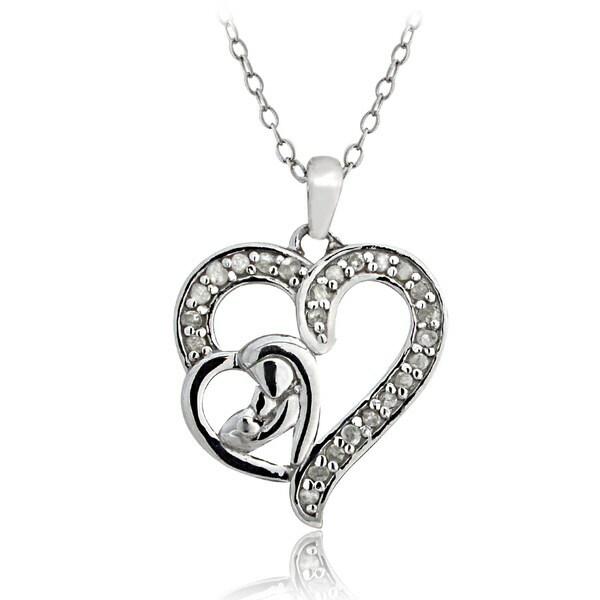 This pendant is crafted in 18K white gold and .07 ct tdw diamond accent stones. 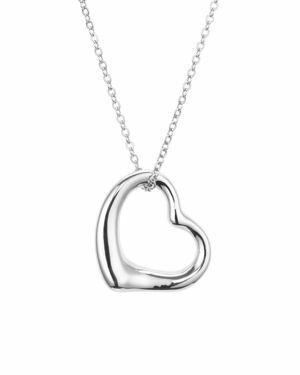 The silver necklace is an 18 inch box style chain with a spring ring clasp.
. - 18K White Gold Hollow Heart Pendant Necklace with A fun take on the classic infinity heart! 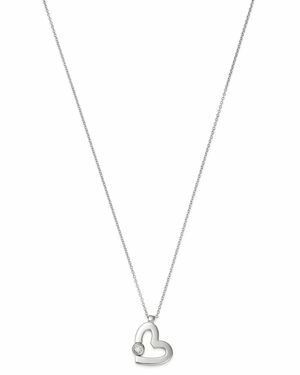 This wispy pendant is crafted in 18K white gold and features .08 ct tdw in diamond accent stones. 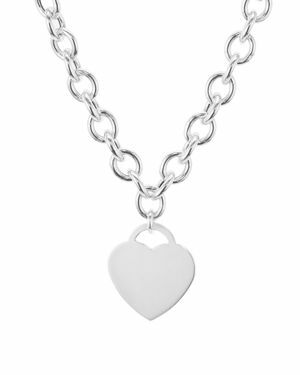 The included necklace is an 18 inch box style chain with a spring ring clasp. 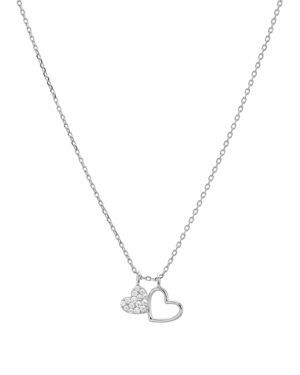 Roberto Coin - 18K White Gold Baby Heart Pendant Necklace with Di From the Tiny Treasures collection a baby heart diamond necklace; with signature ruby accent. 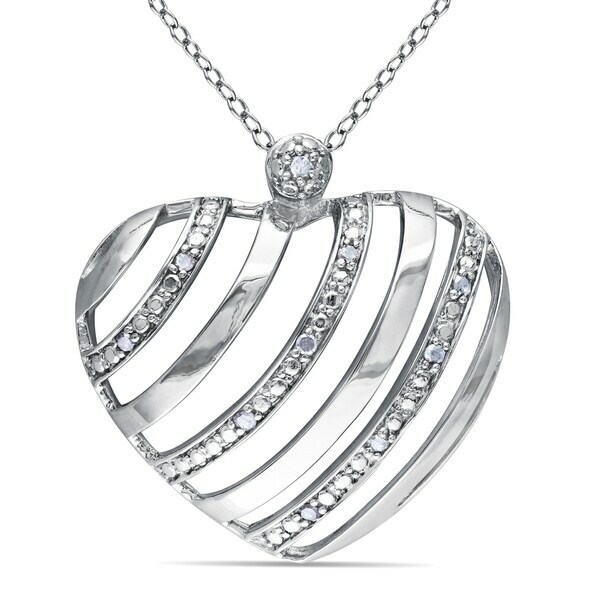 Designed by Roberto Coin. 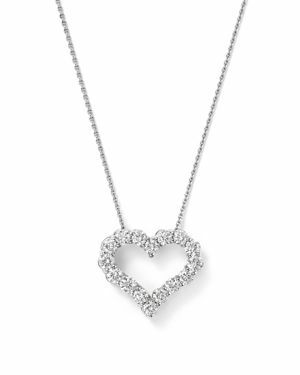 Roberto Coin - 18K White Gold Heart Pendant Necklace with Pave Di A diamond pavA heart necklace. 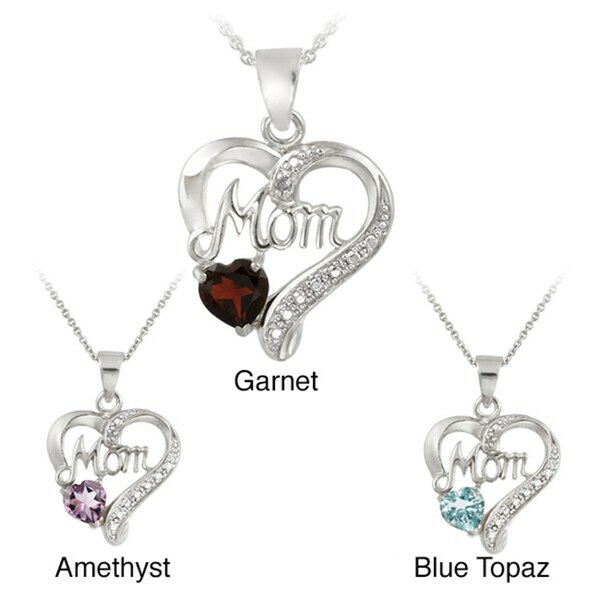 With signature ruby accent. 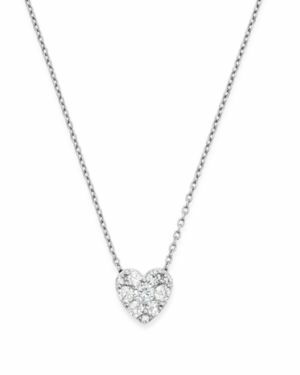 Designed by Roberto Coin.
. - 1/2 CT Diamond 14K Pure Gold Heart Pendant Necklac A stunning 10K pink gold heart pendant delicately hangs from a chain and embellished with small diamond stones. 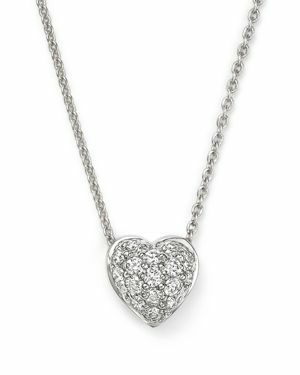 Bloomingdales - Diamond Heart Pendant Necklace in 14K White Gold, Diamond Heart Pendant Necklace in 14K White Gold .50 ct. t.w.
. - Julie Leah 1 3/4 CT TW Diamond 14K White Gold Hear This fabulous one-of-a-kind pendant features a heart-cut white diamond center stone. 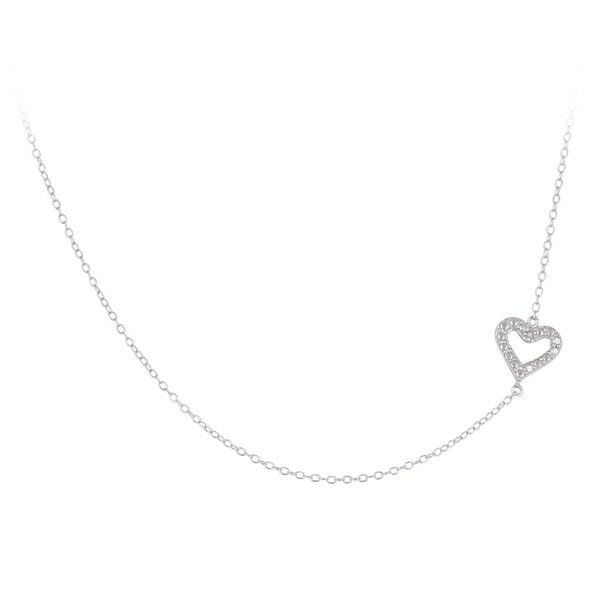 The necklace is enhanced with surrounding diamonds and is set in 14-karat white gold.